Completely CO2 neutral due to the photovoltaic system that is integrated in the building. The building produces more energy than it needs. Modern building technology creates an optimal room climate. The in-house Kompogas system transforms the leftovers from the catering into CO2 neutral energy. Honored with the “Milestone. Tourismuspreis Schweiz”, the most important award of the Swiss tourism industry. Centrally located. 500 parking spaces in the underground car park. The Arena is the centerpiece of the building and it offers on 3,000 m2 space for 4,000 people. Whether banquet, concert or award show, the impressive Arena will surely be remembered. The flexible room concept is very versatile and can be arranged according to your wishes. For your CO2 friendly event there are several seminar- and conference rooms of different sizes (from 20 to 350 people) as well as our outdoor area. Our flexible room concept is very versatile, equipped with modern infrastructure and suited for small meetings, sessions and congresses. Combine your seminar or conference with a guided tour through our exhibitions or with a customized supporting program. Turn your event into a special experience for all participants. Here you find suggestions for your program. Our competent team gladly supports you in the decision making process. General themed tour through the 45 exhibitions on modern, conscious living. 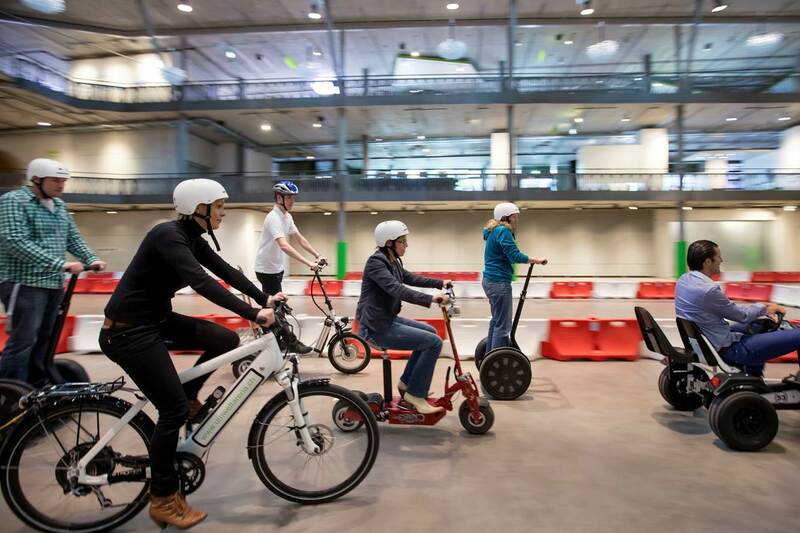 Especially popular are test drives on the in-/outdoor course with two-, three- or four-wheelers like go-kart, e-bike, Segway, e-scooter, space scooter (kickboard), tandem bicycle, elliptigo (a mix of cross trainer and bike), recumbent tricycle and street stepper. As well as with the latest e-cars BMWi3, Nissan Leaf, Renault Twizy, VW e-up or Renault Zoe. Environment kitchen. Spice up your event with a sustainable cooking experience. Our offerings include aperitifs, tastings, cooking and baking courses up to private dining with family, employees, business partners, club colleagues and friends. aperitif. We will spoil you with seasonal products, which are consistently produced in the region and/or are of organic quality. Get inspired by our CO2 reduced and extensive offer. The leftovers will be transformed into energy by our Kompogas system. Festively decorated gala tables ensure a solemn mood. The decoration is produced ecologically and sustainably in school or social projects. Complete your Christmas celebration with a sustainable gala menu and our framework program. Put together a personal event – whether wedding celebration, company anniversary or birthday party. Your creative ideas are at best hands with us – contact us for a viewing appointment or an offering. Experience a sustainable event at the Umwelt Arena. Our competent and reliable team gladly advises you. 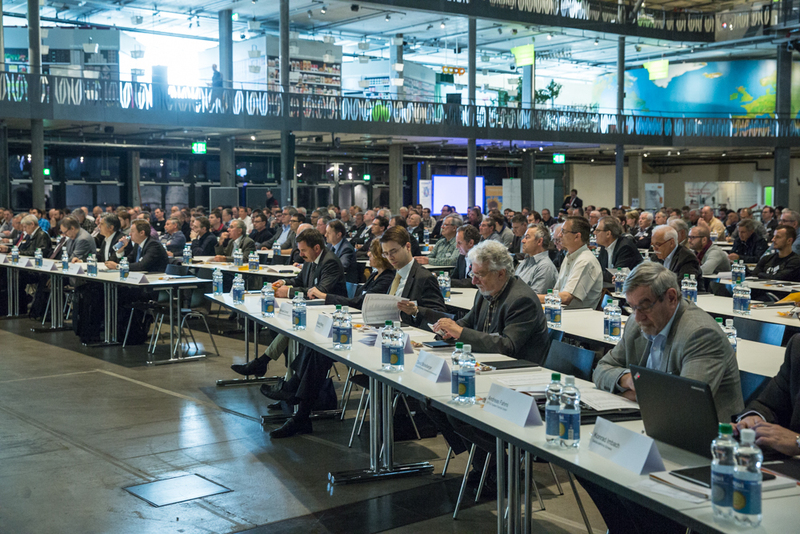 The Umwelt Arena Schweiz is predestined for the realization of different business events. In seven seminar rooms we offer you space for 20 - 350 participants. The seminar rooms 1 - 3 Kuhn may contain on 49 m² each between 27 and 30 people, room 4 – Bircher Benner measures 63 m² and is therefore more spacious. While in the latter 30 people may take place, seminar room 5 – Schuler can host 40 people on 65 m2. Seminar room 6 – Maurer offers on 85 m² up to 60 seats, but the largest room is number 7, Saurer. On 370 m² it provides space for 180 to 350 participants. No matter which room you pick, you will be received and supported by an excellent and modern infrastructure on site. In the course of our attractive half-day or full seminar packages, we gladly serve you a business lunch including a 3-course menu with salad, a seasonal main course and dessert. During your breaks we make coffee and tea available as well as snacks such as fruit basket, “Gipfeli” and pastries.